Well, apparently it was The Snail of Happiness blog’s second birthday yesterday. In those two years, there have been more than 25,000 visits from 118 countries; I’ve written more than 300 posts and there have been more than 3000 comments. Oh, and the filters have prevented more than 7000 spam comments appearing! 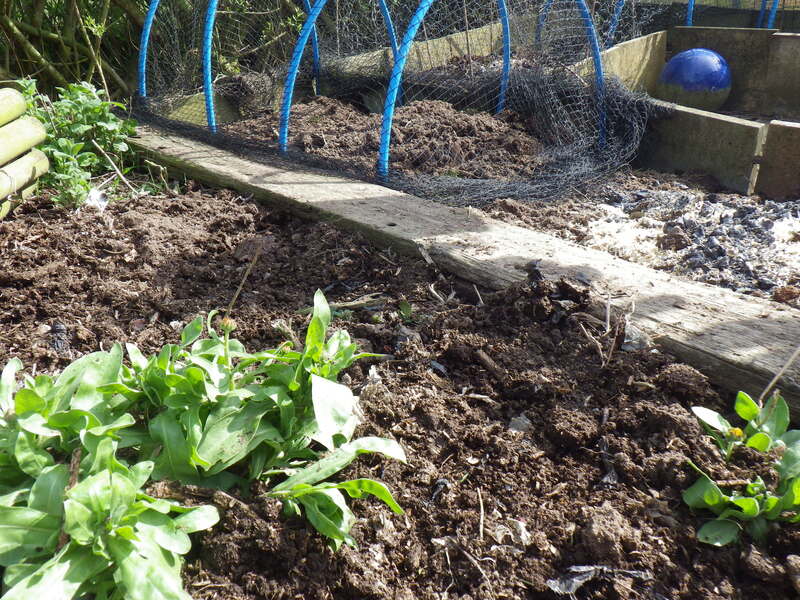 I’m not sure what the appropriate way of celebrating is, but perhaps spreading compost on the garden and planting potatoes (which is what we’ve been doing today) is appropriate for a blog about sustainability. I started writing this blog at round about the same time I embarked on my Diploma in Applied Permaculture Design, partly as a way of sharing some of the information I gathered. It was a happy coincidence, therefore, that yesterday I finished drafting my ninth design for my portfolio. My tenth, and final, design describes my learning pathway and really just needs tidying up and rounding off as this has been an on-going project throughout the diploma. In addition, the Masterpiece blanket, and associated scrapbook, are going to form a tangible representation of my learning. My tutor, Looby Macnamara, is going to give me her square for the masterpiece at our final tutorial on 15 May. I have, therefore, decided that I won’t add any more squares to the blanket after the end of that week… so that’s your deadline if you are planning to send something for inclusion. My final presentation (assuming that all goes well with the assessments) will be in September at the UK Permaculture Convergence… where the masterpiece will have a starring role! 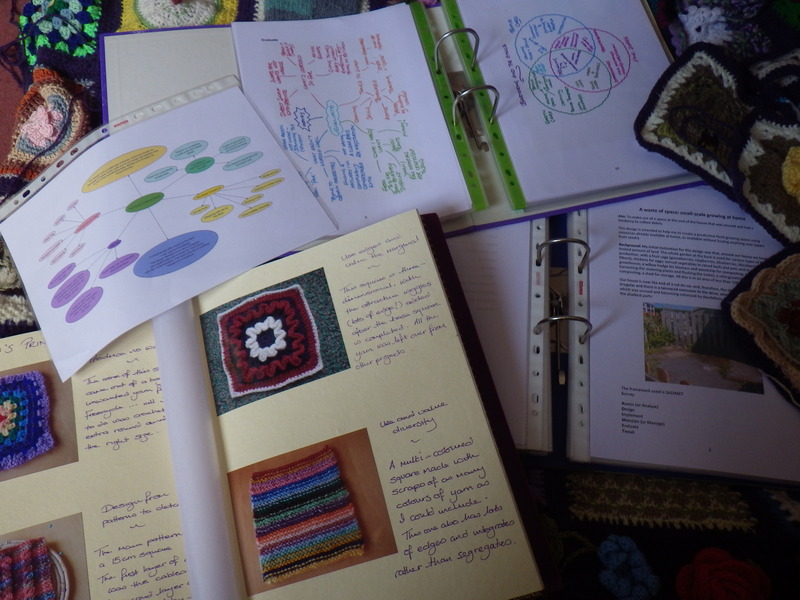 The end of my diploma does not, of course, mean the end of blogging, but it might free up a bit more time for the garden… which has been somewhat neglected over the past two years what with studying, family illness and voluntary work. I am hoping for an abundant summer in 2014 – lots of fruit and vegetables and lots of crafty activities, so lots to write about here. I hope you will keep reading! Well done, Jan. Have also got my potatoes in. trying a new method – no chitting! Will let you know how they develop. Ooh, that’s interesting… I’d love to know how they do! Happy birthday, blog! 😀 I look forward to reading lots more from you…and seeing all of that awesome gardening! Congrats on your second blogiversary! Thank you… here’s to the next two years! Now, that’s a great promise… thanks for your continuing support! Congratulations. I don’t believe I’ve missed a single post of yours, even if I don’t always have time to comment. Thought of you today, particularly, because of the Lithops. I don’t think I can add an image here, can I? I’ll have to find another way to show you my new girl. just writing a new post, my little Lithops will be featured ! Wow… now that is an achievement! Congratulations on sustaining such a professional and fascinating blog. I am only sorry that the Belmont Rooster is not able to wish you well too. I feel that he helped us both by his encouragement and support. I wish you happiness, as I know that this has been a sad year for you and I look forward to more of your great posts.. Thank you… yes, I do miss Lonnie, I just hope that he is ok and will turn up with another fascinating gardening blog one day. Wohoo! Well done! I very much enjoy following your blog, keep at it. Happy anniversary, dear SoH, I am missing our usual free interaction while I’m away, so will have to make a Skype appointment on my return! I am gnashing my teeth on a daily basis here, looking at all the wonderful plants, seeds, bulbs and cuttings I COULD have brought home if Australia didn’t have such draconian laws about importing plant material… I passionately long for a black velvet-leafed taro… Anyway, congratulations on your blogiversary, and talk to you soon, I hope. I’ve enjoyed doing the diploma, but I’ll be glad to finish… it has taken up lots of time and I feel ready to move on to other things now. Don’t worry, though, I seem to be addicted to blogging!